The Monte Carlo chaise from Urbana is "inspired by the design of classic American automobiles." It shows, doesn't it? 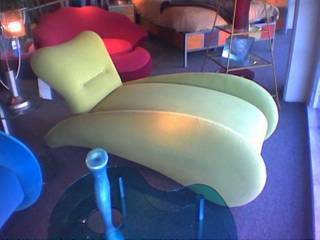 But this chaise isn't just sleek, it's also comfortable and well made. Granted it won't fit in with everyone's decor, but if it fits in with yours, be sure to check it out. Urbana also makes a matching sofa. This was taken at SOMA Sofa in San Francisco, Calif.